There may be a point in your dog’s life when it is necessary for him to temporarily eliminate indoors. Illness, injury, surgery, and old age all qualify as good reasons for allowing a dog to eliminate indoors. Most often these situations require a temporary solution. Our dog Teddy developed advanced kidney disease that caused him to urinate frequently. It was often difficult for him to get outdoors in time so he started to urinate in the house. He picked one location and at first we spent a lot of time cleaning the floor. Soon, we decided that this was one case where training wasn’t going to work so we needed to manage the situation. I placed a piece of plastic on the floor and used two pool “noodles” to prop up the sides. This kept the urine from flowing off of the plastic. It also prevented overspray when Teddy lifted his leg to urinate. Since Teddy was a small dog one end was left open for easier access. Our temporary solution worked so well because Teddy had been urinating in the same location. If your dog is urinating everywhere in your house this could be more difficult. It may require more than one temporary toilet, limiting the dog’s access to specific rooms, diapers or a bit of housetraining. None of these are easy solutions. Diapers can work, but they must be changed frequently to avoid skin irritation, sores and infection. All good reasons why I won’t use them. I’d rather have my floors suffer, not my dog! Housetraining is tricky, particularly with an ill dog. The idea is to have your dog return to the same spot to relieve himself. Access should be easy and therefore in close proximity to where he spends most of his time. I have had some success by using the dog’s urine (or even stool) and placing it on the plastic to encourage him to use a specific spot. On the other hand it is equally as important to keep the area clean. Some dogs will move to another spot if one spot is already oversaturated. 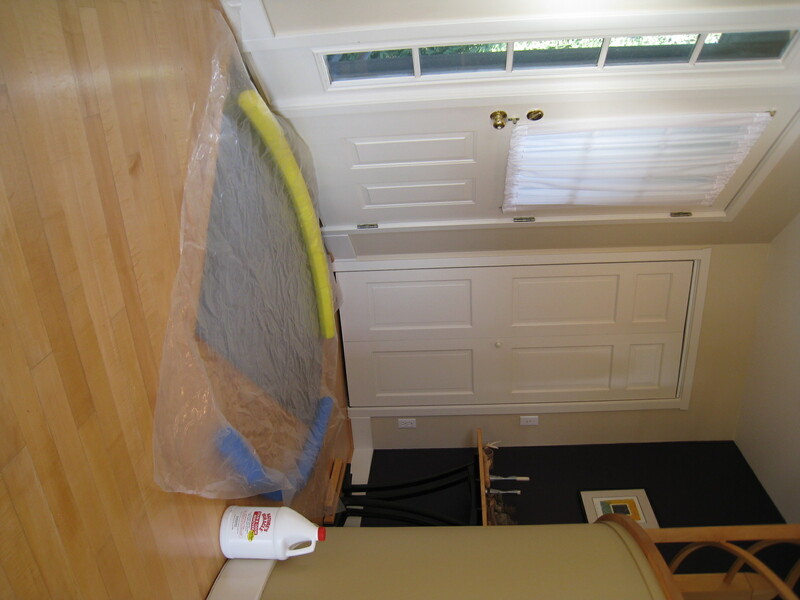 Enzymatic cleaners work well to eliminate odors and stains. In 2009 our Doberman Lena had spinal surgery to reduce a severe compression in her neck. The surgery left her completely paralyzed for nearly 60 days. Since we couldn’t always get her outdoors in time I had to create a bed that could be cleaned easily and that would allow urine to drain through it. You can read more about this in a previous post. In addition to the bed I made, we bought a raised cot style bed. The “Dry as a Bone” Incontinent Bed from Petcot allowed urine to drain through it to a pan below. Sleep Pee Time Bed is a similar product. Both products work well for older dogs with urinary incontinence. A major advantage of small dogs is their ability to adapt to small spaces, including using a small indoor toilet area. If you live in an apartment or have limited access to the outdoors, this makes a lot of sense. Mobility problems or living several stories above the ground floor can make getting your dog outside several times a day a major challenge. In some climates, outdoor exercise may be limited seasonally. In some cases, predators (animal or human) can make outdoor exercise risky. An indoor dog toilet may be the best solution if you fit into one of these categories. The choices range from paper training your dog, using a litter box or installing a real flushable toilet made for dogs. 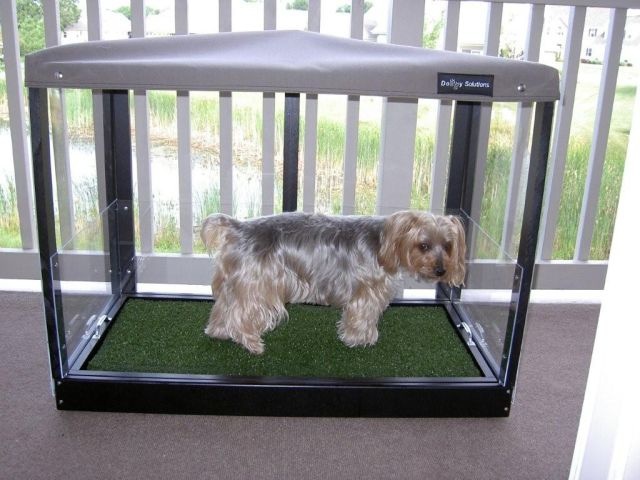 A covered dog potty with synthetic grass. Note the plex-glass walls to prevent overspray. Courtesy Doggy Solutions. When selecting a box style toilet, like the one shown above from Doggy Solutions, it should be wide enough for your dog to circle comfortably, approximately 1-1/2 times his length. For male dogs, “sidewalls” will prevent overspray from leg lifting. These walls should be higher than your dog’s abdomen. Flush toilets include both commercially available examples like The Pet Potty and DIY versions. They are more complicated and require a plumber or someone with plumbing skills. More ideas, information and DIY dog toilets can be found in a sample from the Book. Look for Chapter 8: Bathrooms. “There’s a Dog in the House: A practical guide for creating today’s dog friendly home” includes two chapters with information on dog waste and dog toilets, as well as a comprehensive resource guide at the end of the book. This entry was posted in Care, dogs, Indoor Dog Toilets, Special Needs and tagged Dog, dogs, interior design, Litter box, Toilet. Bookmark the permalink.